Sooth the mind, refresh the soul and ease the trouble heart. Wash away your problems and indulge yourself by reading – Poetry for the Mind. 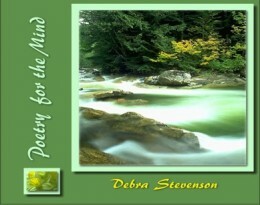 Debra Stevenson is a writer and poet living in Connecticut. She was born in the beautiful island of Trinidad. She discovered her love of poetry after reading the poem, The Begger’s Maid, by Lord Alfred Tennyson. After taking a correspondence course, Debra was encouraged by her teacher to publish her work. She believes that words can have a profound effect on people; it can enrich their lives, make them smile and give them hope.